Our great collection of stunning 9ct yellow gold half set diamond rings are sure to make you the envy of all your friends. Whether you’re looking for dainty and delicate round diamonds set in a detailed band, or large statement diamonds in a subtle plain band, rest assured you’ll find your perfect ring with Orla James. Exquisite diamonds of G/H colour and SI clarity are set into the 9ct yellow gold band half way around the exterior of the ring, making this collection of diamond sets more affordable than our full set diamond range, without having to compromise on diamond quality or brilliance. 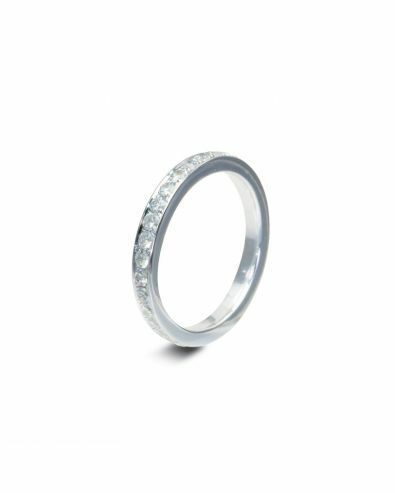 Designed to be worn alongside a yellow gold diamond engagement ring to complete a gorgeous sparkling set of dazzling diamond rings that sits comfortably on the ring and makes a bold statement. The brilliant white diamonds wonderfully contrast and emphasise the boldness of the yellow gold band. Match your 9ct yellow gold half set diamond ring perfectly to your engagement ring by selecting a ring band width and individual diamond size from a range of options, so that you create a personal ring suited to you.